Welcome back to an other OWLS Post. OWLS stand for Otaku Warrior for Liberty and Self-Respect, we are a group of blogger and vlogger who promotes the acceptance of everyone regardless of their gender, ethnicity, sexuality or disabilities. Each month a new prompt is given and using the pop-culture as support, we talk about the topic. At first, I wasn’t sure if I would take part to the January OWLS tour or not, I’m supposed to be on blogging hiatus and when i saw the theme, I wasn’t sure which series I could pick. Before going on with the post, have of to warn you, this post contain spoilers for 4th season set to air in October, unless you have read the manga or you don’t mind the spoiler, I would suggest you to stay away from that post. 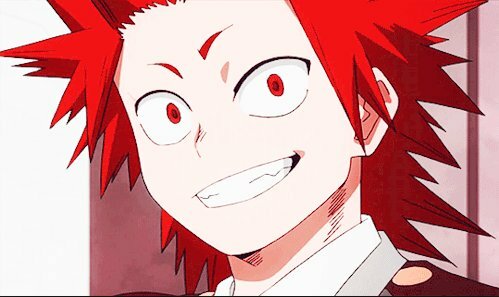 Kirishima is known for his brightful character, his dumb smile is contagious and his simple way to see thing his one of his charming point. However Kirishima wasn’t always the bright character that we know. 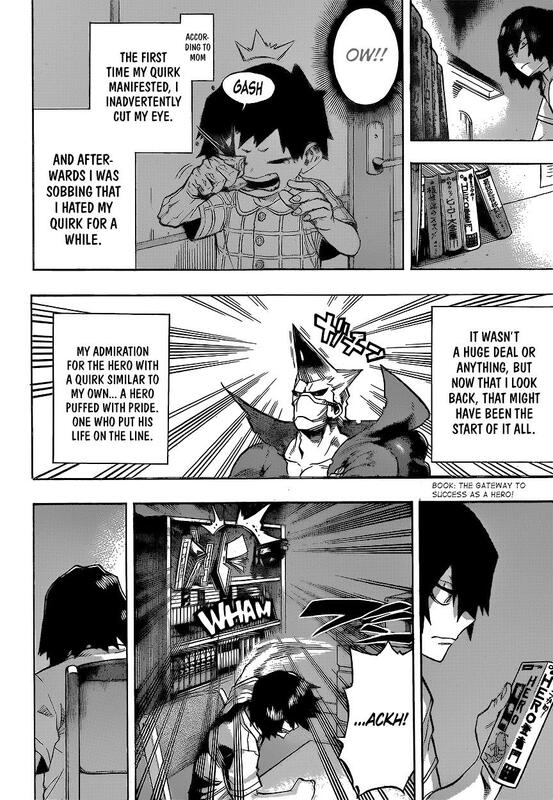 Kirishima was once really insecure, he didn’t found his quirk flashy as other, he found it boring and no one was really believing he could do anything with a quirk like his, however Kirishima still try to live the way his favorite Pro-Hero Crimson Riot was living, it was manly and Kirishima like manly thing. He always tried to help other even if he got beat up. He really tried hard but each time it was the same thing, he failed and people around him keep telling him that she should just give up and he almost gave up after an event during his last year of middle-school. No being able to help his schoolmates, make Kirishima wonder if he could become a Pro-hero one day, maybe the others were right and he didn’t had what he takes, it was only a dream for a normie like him. He was about to give up to go to U.A, crossing out the name of his preferred choice of high-school on the application paper, even throwing across his room a book about how becoming a hero (that I believe being written by Crimson Riot)“The Gateway of Success as Hero”, however after listening to an interview that Crimson Riot did, Kirishima realize that being a hero didn’t mean to be fearless, Hero can be afraid too, but something more terrifying than their own death is the face people that need to be saved made when they are about to die and that failure feeling to not have be able to save them. Kirishima always thought “manly heart” meant to be overly confident, but for his favorite Pro-Hero, this mean to “is a life led without regret”. After hearing this interview, Kirishima began to change, he began to live a life that he will not regret, working hard and even send his application for U.A. His hard work paid off, he was accepted in the hero course in U.A after finish second at the entrance exam. 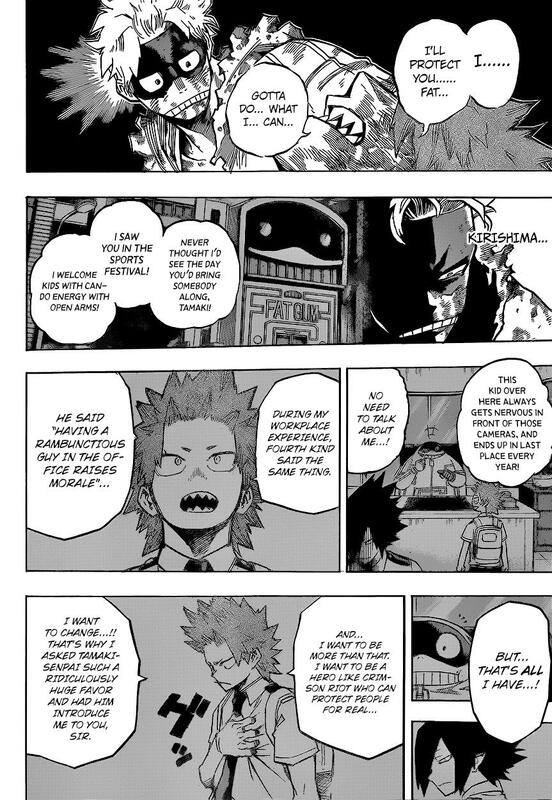 Kirishima was really determined to leave his old self behind to leave a live without regret and this is the reason why he decide to go save Bakugo when his friend was kidnapped by the League of Villain, he would have regret all his life no doing anything to help his friend. 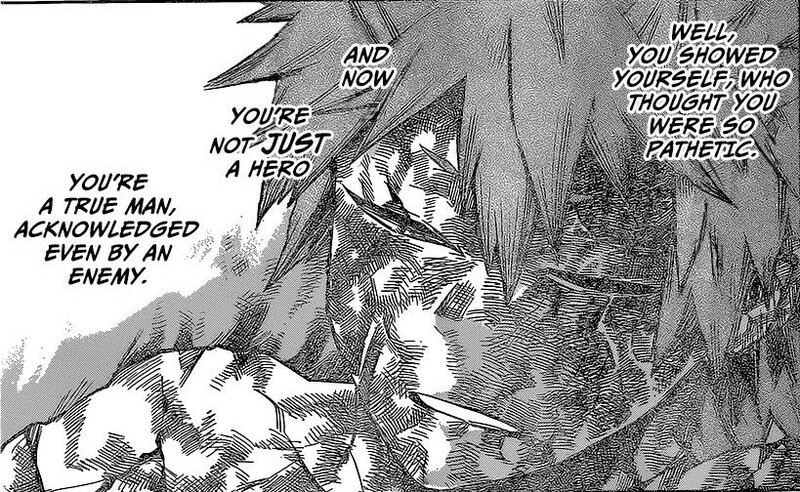 It was maybe foolish (not maybe it was foolish) but Kirishima did what he thought was right for him to do. He act and with the help of Midoriya, Iida, Todoroki and Momo, he saved Bakugo and he would never regret it, if it had to be done again, he would do it again and again. However despite this foolish heroic act, the insecure Kirishima wasn’t really far away and it was only a matter of time those insecurities come back. Second internship, Kirishima get as intern in pro-hero Fat Gum with Tamaki Amajiki (Big 3), the group take part of a special mission with other Pro-Hero and intern student to stop a Yakuza group control by a villain named Overhaul. The mission turn to be a really dangerous one, a life threatening one. The group is really strong, they have strong quirk and know how to use them to work together and fight against the Pro. Once again Kirishima feel helpless, he didn’t knew what to do, he try to fight back but the villains are stronger than him, FatGum need to protect him. Kirishima stand there without being able to do anything while he watch FatGum being beat up by the villain. 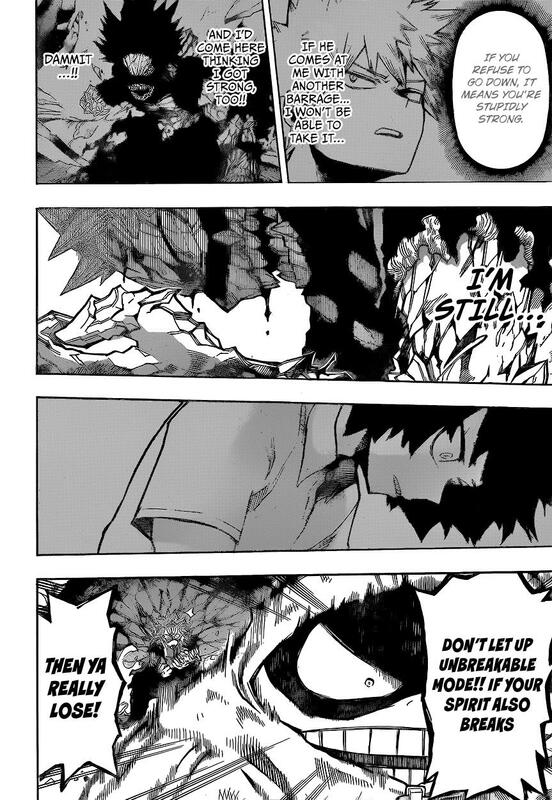 Once again Kirishima doubt of himself, he doubt if he have what it take to be a hero, his strongest technic got broken, the technic he was so proud, Unbreakable, broke under the villain punches. However, despite being scared a feeling powerless, he step in the fight once again after processing FatGum word “Don’t let up Unbreakable Mode, if your spirit also brea, then you really lose” with a stronger Unbreakable Mode (at this point you can barely see any human feature) and receive the punch of the villain destined to FatGum. The punch left Kirishima unable to continue the fight, but this bought enough time to FatGum to finish absorbing the villain energy. Despite being scared, Kirishima still protected FatGum, despite thinking being useless, he still jump in the fight, he didn’t let got that mode that he was so proud off which helped him to let his past, a past that would continually hold him down. In the end, he didn’t only had an unbreakable mode, but also an unbreakable spirit. Kirishima Eijirou, started by being a weak and normie who could only dream of being a hero, but by living a life where regrets doesn’t have any place, he became closer to his dream to becoming a pro by changing his mentality, by understanding what it mean to have a “manly heart”. This was my OWLS post for the January tour, make sure to read Irina’s post published on the 19th, and don’t forget to keep an eye for Zel post that will be published on the 26th. You can also find the whole schedule for the blog tour here and ( don’t normally tend to make promotion like this, but since the artist was nice enough for allowing me to use the print image, I figure I could add this to the post) if you are interested into buying Kirishima’s Origin print from Lowah, you just have to click here. I really hope so! Kiri deserves to have a lot of fan! !